So you’re ready to update or create your membership site. Maybe you’re gearing up for a launch, or expanding your offerings with an updated service. Perhaps you feel like a bit of a do-it-yourselfer that is just looking for a bit of help and guidance. Or you’re a successful and busy business owner looking to just make it happen. Chances are either way you already have some business processes and systems in place and don’t feel like going back to the starting line all over again. That’s the beauty of Formula Done. 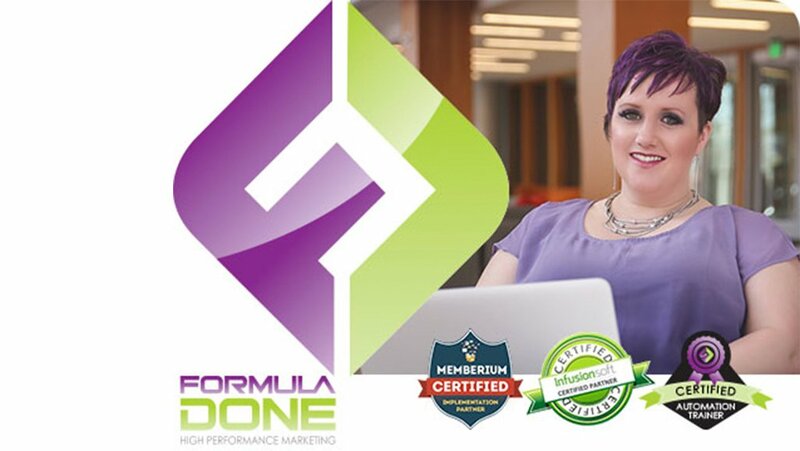 We are a team of Certified Memberium partners, and Certified Infusionsoft Partners – and soon to be Click Funnels Certified as well. We work with many additional plugins including Learn Dash, Badge OS, Gravity Forms, Lead Pages, Thrive, Buddy Press, Schedule Once, Time Trade and many more. We get that you have other systems your new membership site need to work with. Making the win in your business means that you need to have a performance marketing and systems machine. We are expert performance enhancers – and build your machine designed to fit your business. You’ve heard the analogy of buying a Ferrari and leaving it sit in the garage because you’re unfamiliar with how to set it up as a winning machine for you. We’re your one stop shop that will help put you in the winning drivers’ seat or the winning owner’s box. Get your hands dirty or simply review your metrics on a weekly basis. Let’s see if we’re the winning team for your business. If you feel we’re a fit – let’s talk. Jenniferrneal on Skype or schedule a time to talk with me directly.